Spring is around the corner and the terrain is being reborn! 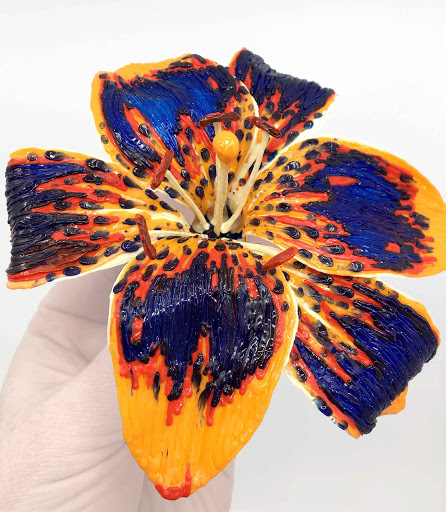 As the leaves unfurl into Spring, 3D pen artist Heather Baharally has been creating beautiful blossoms in celebration of the coming season. We were able to speak with her about her creative process and her personal connection with this special time of year. "I love when the snow melts and you can smell the earth in the air. I love when the lilacs, maydays, cherry and apple trees all blossom at once, and the winds carry their scents and cause a ‘rain’ of pink and white petals. It is a magical and brief time of the year." Can you explain some of the benefits of working with 3D pens as a 3D art medium, as opposed to other 3D mediums you may have worked with in the past? 3D pens are a ‘quick set’ medium, the plastic cooling and firming rapidly after release. It is a very fast media, with no waiting time for baking (clay) or drying time like paint. The plastic is reworkable with heat at any point, unlike baked clay or paper mache. The transparent and metallic plastics add a beautiful range of shine and sparkle. Plastic filament is not like any one media. Rather, it takes on aspects of different art mediums, and can be used in similar ways as many types of media! 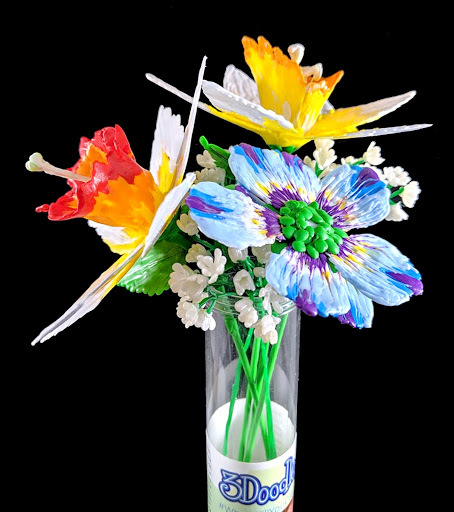 From clay to pen, and even to icing, 3D pens and plastics can take on the forms of so many other mediums, and do so quickly! Doodles can be reworked and refined, or left raw. You can always find new techniques with the plastics, with endless refinements of the process to explore. Inspiration surrounds the creative processes with 3D pens! Why did you select the colors you did for the flowers, and how are those color combinations evocative of springtime? Bold, bright, contrasting colors catch the eye and generate excitement! I love colors that evoke feelings of heat and sunlight. They are true to nature, and embody the realistic recreation of natural shapes and patterns. 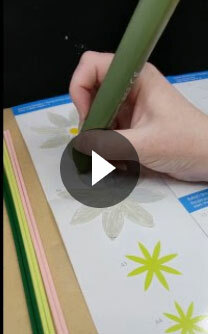 Watch how Heather designs the flowers from start to finish! Describe your process with making the flowers, and the differences between working with the Create+ and the Start. I like bright, high contrast patterns. Dynamic flowers appealed to me. Tiger lilys can always be found in my mother’s garden. Picking subjects that have an emotional connection to me inspires better workmanship. I draw the petals flat, adding layers of color and detail. I observe how the line of my plastic abstracts the line of a petal’s veins in nature. I attach the petals together while drawing the core of the flower, adding pistil, stamen and stem. "With Doodled flowers, the colors stay vibrant all year round. The transparencies can create beautiful reflected lights when touched by sunlight. 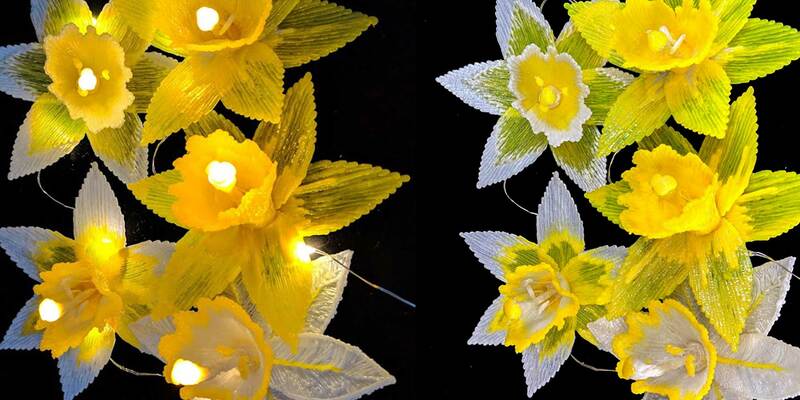 The addition of LEDs allow the flowers to share their blooms at night." While Doodling layers onto petals, it makes them warm and sometimes shapeable. If they are too cool, I use a heat gun for reshaping PLA, as the plastic holds its structure well! I can bend and fold the Doodled PLA and it will retain its lined texture. Through pinching, rolling, and holding the curves in place, I can mimic natural shapes. Start plastic must be warmed at a lower temperature because it is designed to melt with less heat. It responds more like clay when heated. It must be handled delicately, but takes to smoothing well when heated lightly and in small sections. Can you offer any tips or tricks to readers who are using 3D pens to create? Let the line be a line. Allow for the bumps and wiggles to exist, and celebrate the ‘mistakes’! They make the work natural. Create in variety. 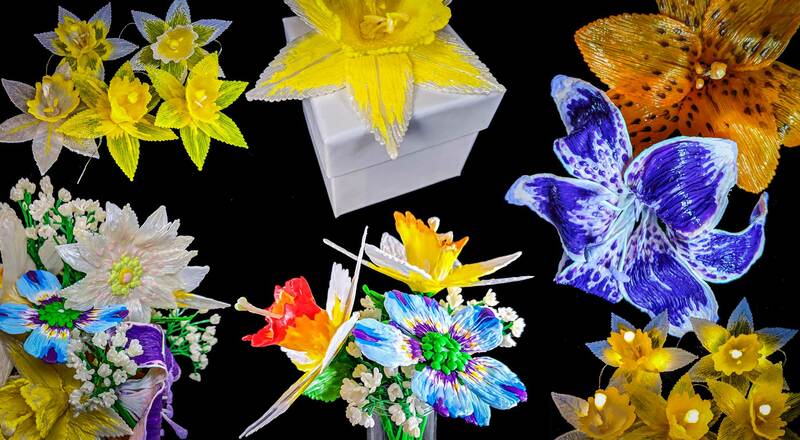 In the case of flowers, play with the size and width of the flower petals. Practice slow lines and fast lines. Don’t draw too much in one place, and allow for filament to cool to avoid warping, unless that’s what you want to achieve of course! Add layers to give projects more detail. Every time you add a line you are adding volume. Leave room for your shapes to grow as you add the layers of detail. Do Heather’s Doodles ignite your inspiration to create? Share your springtime Doodles on social media and connect with our community! Want to create some of your own springtime Doodles? See our flower tutorial here! Canadian artist Heather Baharally started working with 3D pens when she received her first 3Doodler pen from backing the kickstarter campaign. She has spent the last 4 years exploring the endless possibilities of this new and exciting media, developing several unique and distinct techniques and styles using 3Doodler pens. She won several of the early 3Doodler social media challenges and contests, solidifying her intent to use the pen to create artwork. From drawing portraits on plexiglas to large sculptural paintings on canvas, wearable chainmail and masks to 3D fairies and witches, she continues to push the limits of what can be done using 3D pens and plastic filaments.